Costco rotisserie chicken is a huge hit. It seems that no one leaves the store without it. I live a 20 minute drive from a Costco so it wasn’t my first choice for a quick meal BUT after learning about how popular they are I decided to go and get my hands on one of these birds. Why so popular? For $5 you get a three pound fully cooked chicken. This bird costs less than if you cook it yourself – wow! They sell 60 million of these a year and had an outbreak of salmonella in 2013 where they had to recall 40,000 pounds of birds from ONE location in California. Isn’t that insane? I am assuming that since this happened Costco has cleaned up its act. If you read my last post on rotisserie chicken you know that I care about sodium, amount of time on the “hot” table, and antibiotic free birds. As you can see the chicken is injected with a marinade that includes salt. I asked if they had “unseasoned” chickens, but they do not carry them (Whole Foods does). That is A LOT of sodium for 3 ounces of chicken and you can taste it. I think it is too salty. How did they do on the hot table? The deli worker informed me that they pull the Costco rotisserie chicken every two hours but there never is any chicken left. 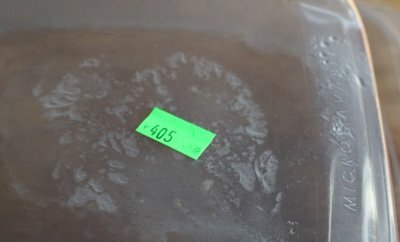 This little green label is the time that the bird was placed on the hot table. I picked this chicken up at 4:10 PM and half the table was already empty. These literally FLY out of the store. Finally, as you can see from the label, it does not say antibiotic free. The good news is that Costco stated in March 2015 that they are phasing out all chicken that has been dosed with antibiotics. Hurray! I love it when corporations do the right thing. If I lived closer, I would be buying these every once in a while because my kids loved it. It is cheap, easy, and saves me messing up my kitchen. Because of the sodium, I wouldn’t make it a weekly thing – maybe more like a monthly thing. I will say that the best choice on my rotisserie chicken journey would be the Whole Foods plain, no salt, rotisserie chicken, $15 for two chickens. These are antibiotic free. If you have the dough, $12 for organic, plain, no salt would be the best (but at that point why not cook your own?). I make a Slow Cooker Whole Chicken that takes me far less time than driving to Costco and my family loves it! UPDATE: as of April 2016 Costco is still using antibiotics in its chicken. There is no timeline that I can find for when the use of antibiotics will be phased out. 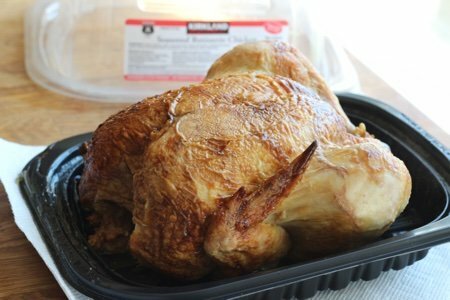 Please share you thoughts on Costco rotisserie chicken. Is Rotisserie Chicken a Good Choice? This is my mug shot of a rotisserie chicken. As you can see, I didn’t shoot its best side. I love Lola's title for your next book, Lisa! Thanks for your research on rotisserie chickens! Who knew??? You do! Keep up the great work!! Was at Costco one day and they were putting a chicken back into the warmer that had been found left behind in a cart in the store. I asked if they knew how long it was out or if it may have been tampered with. The only response I got was "it never left the store." I'll never buy Costco rotisserie chicken again! Thanks, Lisa! I have debated buying Costco's rotisserie chicken many times and the sodium is always the deal breaker. Cooking a whole chicken in the crockpot is my solution. It's so easy and the meat practically falls off the bone just like the ones you get at the store, PLUS, you can season or not season it to your liking! All animal products are bad for humans. The cheaper the meat, the worse it is for you. don't be fooled. If it was properly & humanely cared for you think they would sell it so cheap? Beware of cheap meat - youve no idea what was in food the animal was forced to eat. scary! Fyi: Animal protein doesn't get utilized in the body like fruit & vege protein. And animal protein comes with lots of dangerous saturated fat non in the latter. Eat legumes, beans and veges as much as possible. ADD SPICES, Herbs and research vegan meals. Everything can be made without animals. You and your families health and long happy life depend on it. I have found that our society is an overly "salt oriented" society, meaning that instead of cutting it, they actually CRAVE it and look for it.
. . . and they use rubber bands to hold them in place, a total NO for those of us with latex allergies . . . I use to buy Costco's rotisserie chickens once in awhile and they did taste good. I often wondered what they injected them with though. The last 2 times I did pick one up they were still a little raw. so I do not buy them any longer. Being retired it is just as easy for me to roast my own. Brining birds prior to cooking is a long-established practice. Brined birds make for delicious eats-both due to the enhanced flavors you can introduce to the bird through the brine and the very juicy end product. It sounds like Costco is speeding up the process by injecting instead of soaking their birds overnight in a salt water solution. If you're worried about sodium intake for health reasons, it makes sense to stay away from any product with additional sodium. If the flavor is too salty, by all means don't buy food that doesn't taste good. I typically brine and roast my own birds, but I'll also pick up store-roasted chickens when necessary and not beat myself up about it, because we are very low on processed and pre-packaged foods at my house. It's all about moderation. Thanks for the info, I knew this from the labels and WW meetings, but I still love the convenience of buying these in a pinch, not everyone lives near a Whole Foods or can afford their prices,( we call the store Whole Paycheck). What I'm most impressed with is your follow thru regarding this topic Snack Girl. Thank you! And I love the new proposed book title Sneak Girl. Bringing the real science in where others fail. I'm living with cousins right now and they buy Costco chickens occasionally. My concern has been with how big these chickens are. It's not natural. Americans like to go for big and cheap, and that's exactly what these birds are. Most of us have probably seen videos or pictures of birds that have been fed so many growth hormones that they can't walk near the end of their lives. It's not only cruel to the birds, it has to be unhealthy for humans. I've googled the topic, but I can't find anything. Snack Girl: When you are in Sneak Girl mode, would you please try to find out why Costco's chickens are so massive? Thanks! I LOVE Costco, and I occasionally purchase rotisserie chicken, but I don't purchase Costco's rotisserie chicken. They scare me......the chickens at the Costco where I shop are HUGE!!!! And the consistency is strange. Like they are on something (sorry Costco!) I am glad you cleared up the ingredients but I think I will start doing them in the crock pot like you, and some of the other readers suggest. Several times I've had to return the chickens as I have found them to be bloody, bloody in the center of the breast near the bone. I was told one time that there had been several returns on that same day. I'm done! Agree....too salty! great article....need more info on sodium & calories on Costco kitchen fixings. I always assume lots of sodium in the rotis chicken salad & all their other home make dishes. Daaaaaang I had no idea and I thought safe because just a roasted chicken! Is anything safe? I only get when my job is really really busy! I usually roast my own but now I guess I will always roast my own! UGH! Did you know that 1cup of low sodium canned soup has 480m sodium.? Last week I bought a pkg. of Costco routrissri chicken breast meat with the expiration date of 9-30-15. It was not frozen; wondering if this sealed chicken would really still be good for 2 weeks. I'm half scared to eat it. Anyone know? The weeknight chicken recipe sounds great but 1 tbls. of kosher salt has 3,360 grams of sodium. If you use the pan juices as suggested you're no better off than with the Costco chicken. Also, there are 120 calories in 4 oz. of boneless, skinless chicken breasts vs. 140 in 3 oz. of Costco chicken. Just zip off the skin on the Costco chicken and the calories and fat grams are very close. I have a friend that raises her own chickens with organic non-GMO feed purchased from the Amish. She buys the chicks from them as well then eventually hatches her own. Since they are raised free range (organic) they don't require much feed. Her cost to raise each chicken to maturity is $1.75 and they weigh 6-61/2 lbs., sometimes bigger, in just 8 weeks. They are also hormone and antibiotic free. Some breeds just grow bigger faster as well as having more white meat. Hers have very large breasts and look like bowling balls once cleaned and plucked lol. We love their chickens. Between four of us, it is gone in two days. Also we like salt so that works fine for me. Thank you for the calorie breakdown. The first thing I do when I bring it home is drain all the juice/oil. Sometimes when I make chicken some of the meat has a slight pink color but I know it has been cooked well enough. I check it with a meat thermometer. As long as there is no blood around the leg joint it should be good to eat. There must be a typo in the nutritional info--0g carbs, but 5.6g sugar? Not possible. I stopped buying these after reading the ingredients. The only ingredients you should use are: salt, black pepper, other spices, herbs and sugar. Keep it simple, Costco. It saves you $$$$ and our health. You do realize animal protein is fattening A's causes all kinds of serious deadly heath issues, do these cheaper ones are really bad for us! Why kill your family early with the likes of skiing cigarettes when you easy do much healthier. Do you know that chicken was a real live breathing thinking feeling abused chicken? Have you seen the videos of factory farming chickens? If you do, you won't be able to eat them. If you can't watch then, you shouldn't be allowed to buy them to eat them ignorantly. Costco in Southern California used foster farms chicken for rotisserie - that's definitely not a god thing, and I don't think they've changed it. We don't buy anything chicken from them as we are pretty sure they use same for all n house chicken meals. We, on occasion, get Ralphs', they have no salt and are delicious. Whole foods is the best choice for store bought, agreed. But I will be keeping the ATK recipe - best choice. Thank you, I'm very pleased I've "found" your site. Quote: "There must be a typo in the nutritional info--0g carbs, but 5.6g sugar? Not possible." I have to agree with Kelly ~ the numbers just don't add up. Can someone shed some light on this? I used to purchase Costco rotisserie chicken but after looking at the label earlier this week when visiting my local Costco and finding this post, I won't pick up many, if any, chickens from Costco again. I <3 Nom Nom Paleo and will definitely use her recipe the next time I roast a bird (lowering the amount of salt used). We have loved Costco chickens in the past. Over the past six months they are undercooking their chickens. I talked with the managers and they say it is the chickens they get and not their cooking times that make them undercooked. They admit they have received numerious complaints about this undercooking. They had a Samonela outbreak in 2013. Have anyone else experienced this? We stopped purchasing any Costco/made by Costco chicken and their chicken products as they use foster farms chicken, and we know what happened, and continues to happen with foster farms' chickens. I'm not even sure what antibiotic free means since 90% of them (antibiotics) are processed and pissed out. Yep, I'm a pharmacist and I know about the metabolic process. These birds are great and they taste great. That is all you need to know. I don't that is all there is to it, The chickens at costco are undercooked and I don't like the way they taste undercooked, therefore, I no longer buy them at costco. I go to Stater bros where they are cooked enough and don't looked like the chicken's that are shot full of hormones and look like small turkeys! I am always amused how these forums concerning evil meat consumption become targets for vegan attacks. The assumption every eaten animal is raised in misery in a tight metal cage with a feeding funnel stuffed thru a hole in its throat and tortured with a daily forced showing of a PETA video until it begs for death. I wonder if vegan forums are routinely attacked by consumers of animal proteins, forced to read recipes for smoked tri tip and pulled pork? I fear that vegans suffer from serious iron and B-Vitamin deficiencies that affect their cognition, to say nothing of the fact that they are always so skinny and frail, prima facie evidence that a Vegan Diet is not good for you or humanity. There is also the fact that vegans and vegetarians are immoral. Humans have been eating meat much longer than we have been eating beans or refined starches. It was our ancestors who first ate meat that led to the development of the neo-cortex, the part of our brain that separates us from animals and created civilization. Any anthropologist or biological scientist will confirm this. Thus, it is the vegans and vegetarians that are the immoral actors, benefitting from all of the machinations of the modern human brain and it's abilities, without contributing to it's continued maintenance or development. If a serving of chicken contains 5.6 grams of sugar, I don't see how the label says "0 carbohydrate." As a person with diabetes, it's my job to ask these questions! This amount of added sugar corresponds to 6 grams of carbohydrate per serving. That's which is not much for a non-diabetic, but for me, it's nearly 1/3 of daily allowance of carb...Thanks for posting the label. I would love for Costco to eliminate salt, antibiotics and steroids! What would it cost if they did? Healthier and tasty too! I'm thinking that maybe the sugars are what makes them taste so good and what it is that people are craving in these birds. Thoughts? @Heather - my thinking is that those additives are mostly for texture and maybe a little bit for taste. I think the salt is what people are after. It is hard to know. I would love to taste one of these birds without that stuff on it. Bottom line: Way too much salt. Who eats only 3 ounces? I can eat a half chicken at one sitting. The thought of all that salt gives me angina! On the kitchen counter was a rotisserie chicken. My son in law says he picks one up when he does a Costco run. I was hungry and got permission to help myself. I am a senior woman raised two husbands and three children. This bird was the best I have ever tasted. It was juicy, very flavourful, very tender. I was really surprised it was so delicious. Don't know how this is accomplished. Don't care. I'm reading this in 11/2017. I had no idea to even consider it. Thank you for bringing it to our attention. Have they made any changes regarding antibiotics? I don't see how they could with the volume of animals they need to raise and process. How is it possible to have 5.6g of sugar and 0g of carbs? I'm on a low carb diet and this does not make sense. @Max - that was a mistake. It is zero carbs and zero sugar. I have changed it in the original post. Thanks for pointing it out! Thank you so much for all this info! I have been wanting to try a Costco chicken but don't have a membership so I Googled their chicken before buying a membership. Based on what I read, I will not be buying their chickens. I am required a low salt diet and I am sensitive to the latex so the info on what they use as ties really helped me!